My first installment during Castle Grayskull Week is a two-pack that we’ve had sitting around for a while now. Another great army builder set, the Snake Men two-pack offers a chance at finally diversifying your serpent army beyond just the main characters. Before this set was announced, it seemed that most people thought the Horde Trooper would be the next army builder two-pack. Not that I wouldn’t love to get a bunch of Horde Bots, but I’m really happy they decided to go with the Snake Men first. 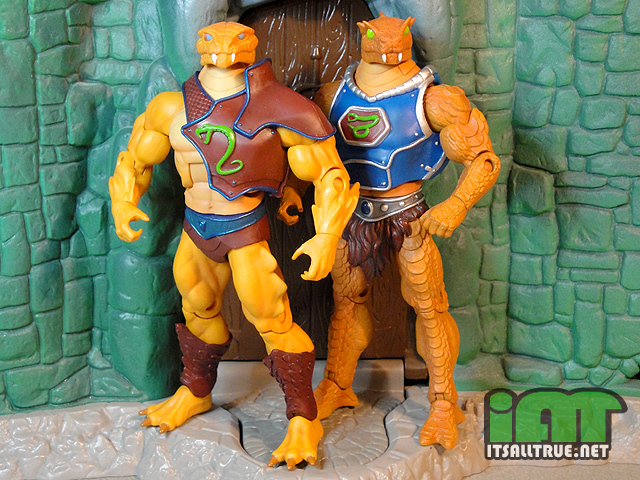 There’re hundreds of these guys running around in the MOTU-verse, and they come in a variety of colors and species. Before the line ends I’d like my Hssss to have a decent sized army under his command. Similar to the Palace Guards, the Snake Men two-pack is an army builder that comes with four different heads. While all four snake heads do look similar (Is that racist? ), there are some distinct differences that make each one unique. Most noticeably is the shape of each head and color of their eyes. The red eyed one has a rounder head with a small open mouth, while the yellow eyed one has a flatter head with a much wider mouth. The blue eyed snake also has a flat head, but comes with a closed mouth instead. Yellow and Blue actually look like they could be the same head in different positions if it weren’t for the differences in their skin color and eyes. My favorite head of the four is Green Eyes. His mouth is closed and he has these fantastic looking ridges above his eyes that really give his head a lot of character. 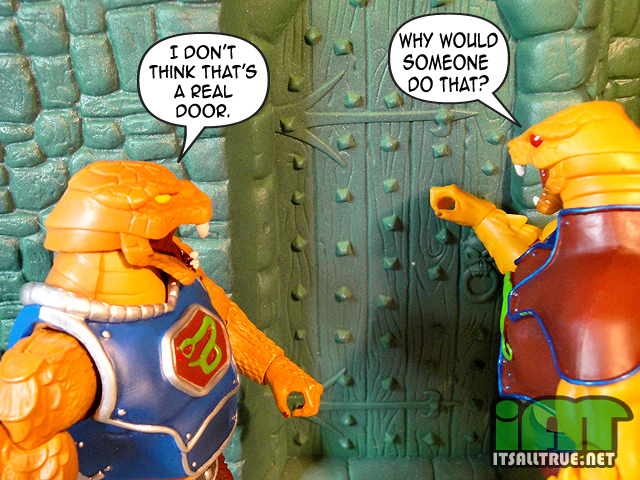 Unlike the Palace Guards, the Snake Men have two different bodies. I’m definitely glad they went this route since the Snake race comes in so many different shapes and species. The first figure is General Rattlor’s arms and legs with a human chest. They also added on a scaled neck piece that fits in well with the various heads. I really like the reuse of Rattlor’s pieces. They have some great sculpted scales all over, which definitely helps the figure stand out from most of his snake brethren. The other snake body is a hodgepodge of various villain pieces. He’s got the normal chest, shoulders, and biceps. He’s got the spiky forearms and boots. He’s got the Skeletor hands and feet, with the bumpy thighs and that new scaly neck piece. 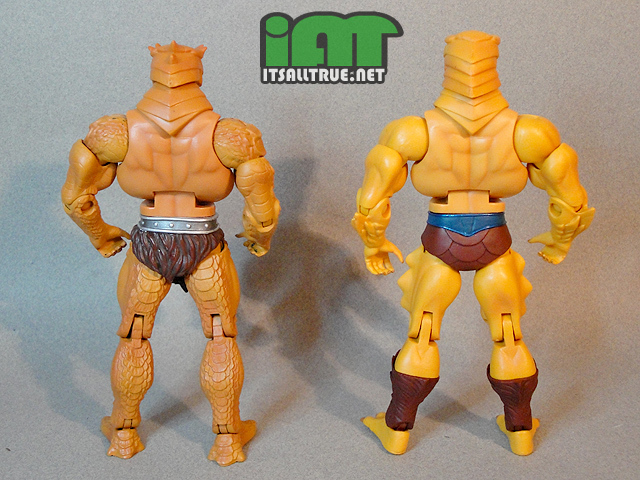 Instead of the loincloth, he’s wearing the snake scaled underwear. This body isn’t quite as impressive when it comes to detail, but it still passes well for a snake minion. 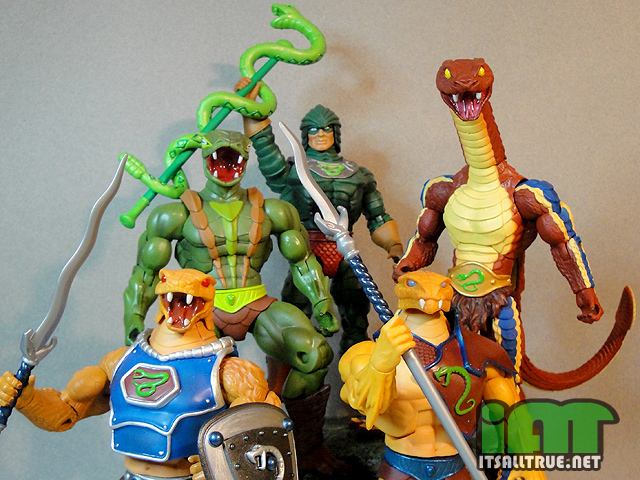 I wish the fur pants would be on the other less scaley Snakeman, so it can be a He-Man turned into Snake more easier. He looks fun with the armor on, now only need to find out how to change them pants, hehe. I hope my Rattlor and Frosta will come soon! Great review, excellent pictures! Love the Sorceress’ final comment! I love how the Snake Men look together. They’re usually the least favorite faction of most fans, but I always loved me some Conan-esque sword & sorcery, so evil snake people is something I love! I wish there’d been a green snake man in this set, but I realize that would have made the four heads less interchangable. Maybe a repaint sometime down the line. And I’m sure that a Horde Trooper 2-pack is the unannounced $50 item for 2013 they were talking about. Yeah, come to think of it, there are Snake Men in a LOT of different fictional properties. Does it tap into racial memories of when our ancestors were all little fuzzballs trying to hide from dinosaurs? Were there actually reptilian sentients on Earth that are now extinct and consigned to legend? Or are sword-and-sorcery thinker-uppers just not very original on the whole? There’s been some psychological theories that the extremely common phobia against snakes and spiders is a hardwired memory of the time when those critters were an extremely common cause of death. Or the lack of originality. Hehe. But yeah, evil snake people is one of those things. Even the Babylonians had them! I thought one of the Q&As asked about a recolored set for re-release, and they gave the usual “we have no plans for that” or something that didn’t sound very hopeful? Digging this set the more I see it. Just wish I was custom maker cause I would so make a coral snake out of one of these. Think would be cool for a variant or special troop. With so many different snake species and patterns Mattelbshould have some fun with these. I keep hearing the coral pattern recommendation, it’s a great idea. I love this set, but the possibilities of different paint schemes based on snakes (desert snakes, copperheads, diamondbacks) offers so many unexplored variations. I know spots are getting more and more limited, but in a utopia this pack would get another run with more decos. I kind of regret only getting one set now as I want to have four different Snakemen now (for some reason I was thinking the two heads were identical to the open mouthed versions when I bought them at the time). Love that last pic with the Sorceress. That last pic is GOLD! i still don’t get how they couldn’t cost out a spare of the snake trooper weapons, any one of them, for rattlor… friggin logistics. the sculpting on the rattlor buck though, that is a thing of beauty. that’s why the horsemen are crucial to the success of this line, nobody sculpts texture like the horsemen. Excellent review as always–the best 2 army builder set right now until Horde Troopers are designed!! That armor does look better on Rattlor. also the one of all the snake men…How much do I have to pay you guys to come to the IAT “how to take awesome pics” summer camp this year? So a quick question for the math geeks out there: With 2 different bodies, 4 different heads and 2 different sets of armor, how many combinations of snake men can be created? How cool would it be to have a whole snake army made up of entirely unique Snake-men? I used to know how to figure this out, but this type of knowledge was pushed out of my brain a looooong time ago so that I could remember important things like “the complete title history of the WWF World Heavyweight Championship”. Priorities. I want to say it’s 16. I was also including the orange heads on the yellow body… even though it wouldn’t make much sense. However, I didn’t include an armorless body as an armor option, so it would go up to 24 different kinds of set-ups. Thanks for the thinkin’ assist, amigos! I like that this is an “army-builder” that allows some small amount of customization. Pretty cool. yep, I would give this combo at least 24 mixes. Awesome as always (love the sorceress Matty answer) Glad i got 2 sets of these bad boys. 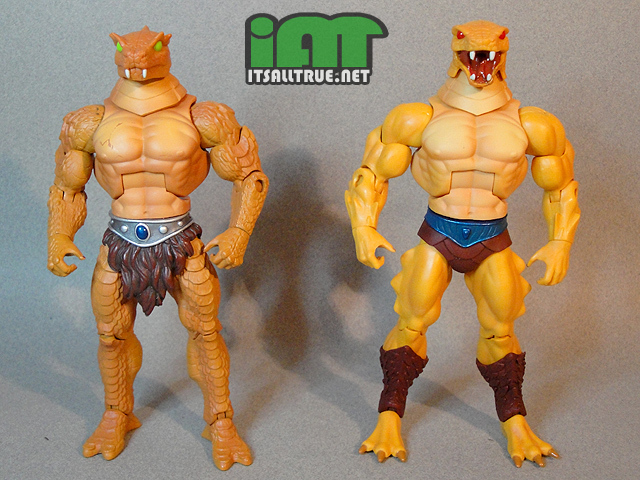 I hope they release them in new colors sometime in the future..
if you take the upcoming new adventures of he-man head and put it on that custom he-man body it would make a perfect 200x he-man. I got stuck with these two guys due to the sub. It’s a good thing that they look more less generic looking than the Palace Guards. Think I’ll christen ’em “Lou and Norm” in tribute to the legendary Filmation co-founding greats. Yeah!